Eschew the tourist crowds and head to Eastern Beach Reserve and Yarra River. 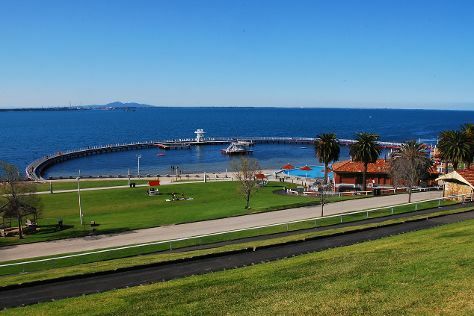 Get out of town with these interesting Melbourne side-trips: St Augustine's Church (in Creswick), Hepburn Lagoon - Trail Rides (in Hepburn Springs) and Lake Wendouree (in Ballarat). Next up on the itinerary: take in nature's colorful creations at Royal Botanic Gardens, wander the streets of Degraves Street, admire the landmark architecture of Shrine of Remembrance, and take in the spiritual surroundings of St. Patrick's Cathedral. To find ratings, maps, where to stay, and other tourist information, go to the Melbourne attractions planner. Shanghai, China to Melbourne is an approximately 14-hour flight. You can also do a combination of train and flight; or do a combination of flight and shuttle. Due to the time zone difference, you'll lose 2 hours traveling from Shanghai to Melbourne. Prepare for cooler weather when traveling from Shanghai in July: high temperatures in Melbourne hover around 15°C and lows are around 6°C. Wrap up your sightseeing on the 9th (Tue) early enough to travel to Sydney. Eschew the tourist crowds and head to Wentworth Falls and Dolphin & Whale Watching. Venture out of the city with trips to Day FIne Art (in Blackheath) and The Giant Stairway (in Katoomba). And it doesn't end there: see a show at Sydney Opera House, take a stroll through Darling Harbour, examine the collection at Australian National Maritime Museum, and see the sky in a new way at Sydney Observatory. For photos, reviews, where to stay, and other tourist information, read our Sydney online journey planner . Getting from Melbourne to Sydney by flight takes about 3.5 hours. Other options: do a combination of shuttle and flight; or drive. When traveling from Melbourne in July, plan for a bit warmer days and about the same nights in Sydney: temperatures range from 21°C by day to 9°C at night. You'll have a few hours on the 16th (Tue) to wrap things up before traveling home.